Eric’s Fish & Chips01485 525886work Fish & ChipsEric’s Fish & Chips is the restaurant and take away owned and run by celebrated local chef Eric Snaith, with the help of his team from nearby hotel, Titchwell Manor Hotel. Sitting pretty along the picturesque Norfolk coast, Eric’s Fish & Chips harks back to traditional British fish and chip restaurants with a few modern twists; try the black garlic mayo for example. Fresh and simple seaside favourites are what it’s all about at Eric’s Fish & Chips with a focus on sourcing the best possible produce, from using the finest cod available to using real local beer in the batter. In addition, everything is made from hand where possible to ensure the optimum freshness, including the chunky tartare sauce and local favourite, curry sauce. A concise wine list of European and New World bottles from long-running Titchwell Manor supplier Hallgarten Druit is available, alongside a great selection of Prosecco, champagne, craft beers and lagers. Add to that a friendly, relaxed environment and interiors styled by Shaun Clarkson, and you’ve got a must visit restaurant for the whole family. 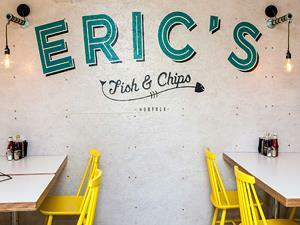 Eric’s Fish & Chips is the restaurant and take away owned and run by celebrated local chef Eric Snaith, with the help of his team from nearby hotel, Titchwell Manor Hotel. Eric’s is open 7 days a week 12-9pm.